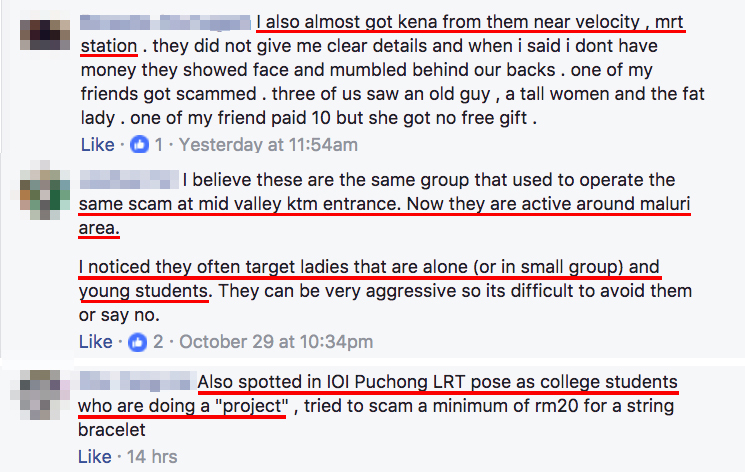 Facebook user Tan warned others about his recent experience when he was approached by a man and another woman near the MyTown Shopping Centre area. According to Tan, he was with three other friends when the man pulled him aside to write down his personal details at the pretence of asking him to be part of a survey. At the same time, the woman approached his friends to do the same. However, when they tried to leave after giving their personal details for the supposed survey, the couple demanded that Tan and his friends pay up a certain amount of money requested by them. The couple threatened the group of friends, saying that they will not let them go if they refuse to surrender their money as per their request. "They will come to you and ask for your name, age, and all. They will sweet talk you and say it's a survey." "But in the end, they will ask u to pay. Sorry. They will FORCE you to pay. Minimum RM20. They say they will give you free gift," he wrote in the post. Fearing that something bad might happen, Tan and his friends gave in to the request for money and he was given a pen as a "free gift". "A PEN FOR RM30! IT'S RIDICULOUS," he remarked. 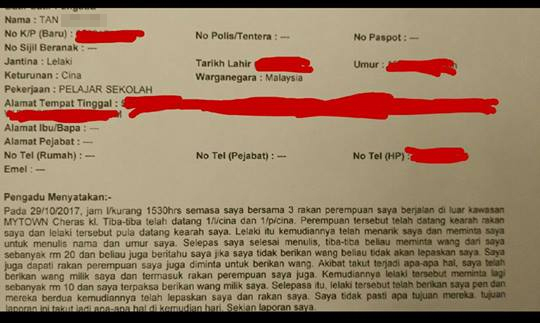 Prior to making the police report yesterday, 30 October, Tan had also escalated the matter to the mall management. He was told that the mall's security management has already been informed about the matter and that they are looking into other measures to address the issue. Tan said that based on what he has learned, the MyTown and the nearby Cochrane MRT Station are one of the current "hotspots" where the scammers like to lurk around to prey on unsuspecting victims. "They are also said to be targeting people who are alone, groups of girls, and groups of teenagers. They have also been spotted at locations such as Pavilion, Sunway Velocity, Mid Valley, and CIMB Taman Connaught. Please be more aware." "They have also been spotted at KLCC, Times Square, LRT Titiwangsa, LRT Wangsa Maju, and LRT IOI Puchong Jaya," Tan said in another update. Comments from netizens who shared about their own experiences. One particular person even said that he has seen them about nine years ago at the Berjaya Times Square pedestrian bridge. Based on the accounts from those who have fallen victim to such scams, the scammers usually work in a group of two or three and they would pretend to conduct surveys as part of their fraud scheme. They would approach unsuspecting bystanders at public spaces such as major shopping malls and train stations. These individuals are usually dressed casually and they do not have any kind of identification on them. Once the targeted person give his or her personal details for the fake survey, the perpetrators would sometimes give an item such as a pen or a bracelet. 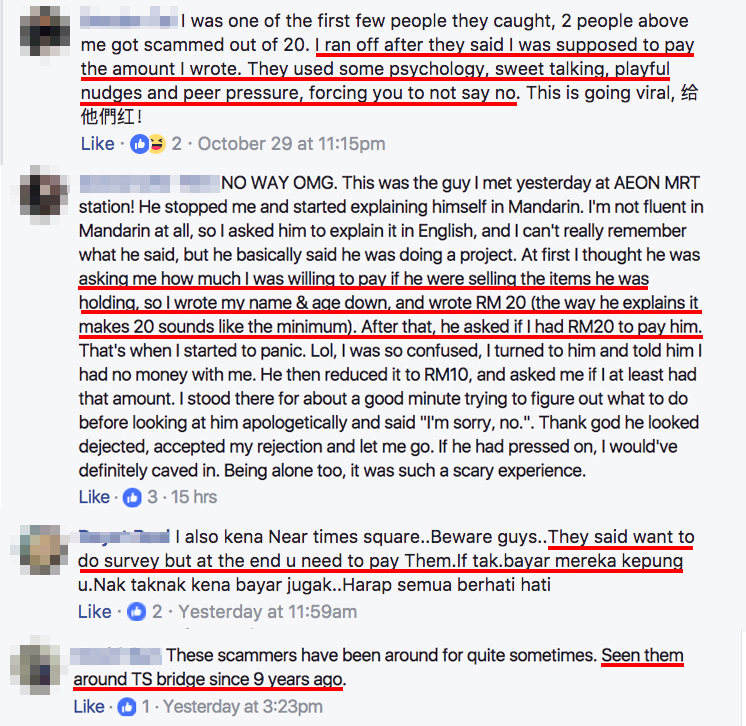 The perpetrators would then ask how much would the person be willing to pay for the item, and the minimum amount is usually set at RM20. As the person writes down the amount he or she is willing to pay for the item, the perpetrators would pressure the victim into paying the amount that was written and they will receive the item as a "gift" in return. In most cases, people panic and give in to their demands. Some others said that they refused to pay and just walked away. A Facebook post detailing the incident has gone viral. The leak of the mobile data was reported earlier this month by a local tech news site. "We (the dancers) were treated badly whenever the payment issue was brought up."